4 Beds 3 Baths 1,800 Sq. ft.
Wow! 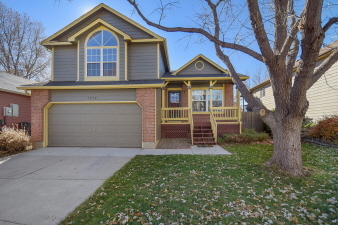 This super cute home in highly desired Columbine Meadows is move in ready. You'll be impressed the moment you walk in with laminate wood flooring, vaulted ceilings, brand new kitchen to include new cabinetry and stainless appliance suite. This home just goes and goes - 4 floors allows space for all with well proportioned living space throughout. Huge master retreat with soaring ceilings, oversized window for lots of natural light, and en suite bath. This well maintained home just had the exterior painted last year; 2 year old carpet; finished basement; interior just painted; 5 yr old roof; brand new slider; newer water heater; and brand new AC. Cherry on top is the gate to open space and trail system the home backs to. Massive park system just a short walk away. This one is ready to be called home! Buyer and Agent to verify all info.